Marinated chicken breast with spiced rice and a tomato and yogurt sauce, topped with onions. 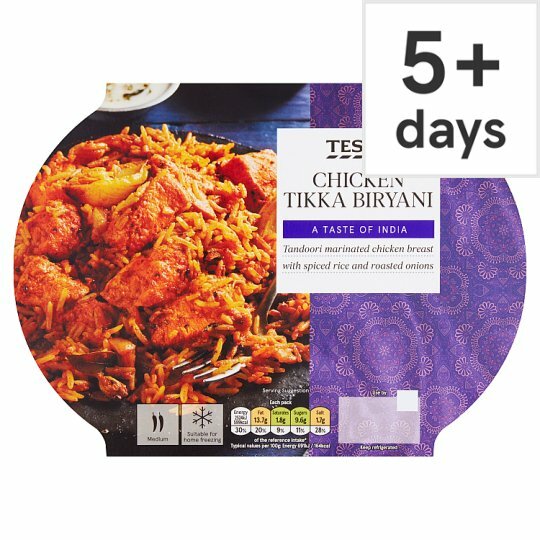 INGREDIENTS: Cooked Biryani Rice [Water, Basmati Rice, Tomato, Rapeseed Oil, Coriander, Concentrated Lemon Juice, Black Mustard Seed, Cumin Seeds, Cardamom Pods, Cardamom Powder, Bay Leaf Powder, Salt, Clove Powder], Chicken Breast (25%), Tomato Purée, Onion, Yogurt (Milk), Ginger Purée, Garlic Purée, Rapeseed Oil, Salt, Cornflour, Soya Oil, Palm Oil, Green Chilli Purée, Coriander Powder, Cumin Powder, Paprika, Turmeric, Mint, Coriander, Fenugreek Leaf, Chilli Powder, Colour (Paprika Extract), Black Pepper, Cinnamon Powder, Curry Leaf, Cardamom Powder, Clove Powder, Fennel, Ginger Powder, Mace, Star Anise, Fenugreek, Basil, Dill, Sunflower Oil. Instructions: 190°C/Fan 170°C/Gas 5 20 mins. Place on a baking tray in the centre of a pre-heated oven. Leave to stand for 2 minutes after heating. Stir before serving. Instructions: For best results heat in a microwave. Leave to stand for 2 minutes after heating. Stir before serving. Caution: Although every care has been taken to remove bones, some may remain.Caution: This product may contain whole spices which should be removed prior to consumption.